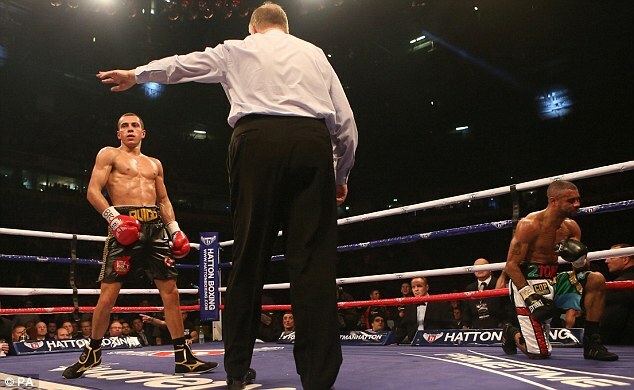 Scott Quigg was hugely impressive in stopping Rendall Munroe in the sixth round of their super-bantamweight rematch at the Manchester Arena. The pair met previously in June but a nasty cut above Munroe's right eye saw the fight stopped in the third round as a technical draw. But there was no doubting the superior man tonight as Quigg, 24, worked his way into the bout before forcing his opponent to twice take a knee thanks to some penetrating body shots. Hailing from Bury, Quigg was the home favourite but it was Munroe, who challenged Toshiaki Nishioka for the WBC world title two years ago, who was the busier fighter in round one. At this stage, a lot of punches were merely finding the other man's leather but Quigg's work rate began to tell from the second stanza although Munroe reminded his younger opponent of his power on more than one occasion in the next. But from round four onwards, Quigg was in the ascendancy as he repeatedly targeted his 32-year-old adversary's ribs with increasing success. There was a bizarre moment in the fifth session when Munroe stopped to complain about a punch round the back, leaving himself exposed to a stiff jab. Having ended that round on top, Quigg completed the job before the halfway point and it was no surprise that it came from shots downstairs. A big left hand saw Munroe take a knee and although he beat the count, the fight was waved off after another flurry had the same effect with less than 30 seconds of the round remaining. In making such an emphatic statement, Quigg takes home the interim WBA world super bantamweight title and moves closer to a shot at the elite fighters in the division, as well as British rival Carl Frampton.